Photos from Gail Herbert, no reproduction without permission. ‘Reaching for the Skies’ was a twelve part documentary series about the history of flight, transmitted on BBC 2 in 1988. The series was a co-production produced at BBC Pebble Mill. John Gau was the executive producer, Ivan Rendall the series producer, and Tony Salmon one of the directors. Peter Gower was one of the editors on the series, and Gail Herbert was a production assistant on it. The episode list included: Pioneers (12/9/88), The Aeroplane Goes to War (19/9/88), Trailblazers (26/9/88), Lighter than Air (3/10/88), Bombers (10/10/88), Quest for Speed (17/10/88), Giants of the Air (24/10/88), Rivals over the Atlantic (31/10/88), Fighters (7/11/88), Vertical Flight (14/11/88), Victory over the Sea (21/11/88), The Adventure of Flight (28/11/88). 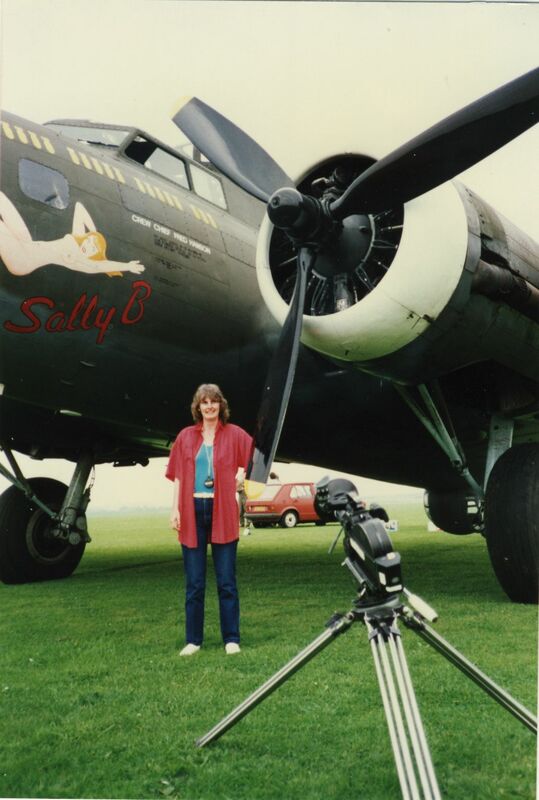 The photos show filming of a B17 bomber, a Spitfire, and a Lancaster bomber. i did some filming on that too – at raf coningsby – tornados. I thought they were amazing and the guys who flew them too! it was all about the history of flight. great.